The Horn of Africa is one of the world’s most impoverished regions. In 2006 it was the subject of one of the worst famines the world has ever seen. Its impact remains to this day. This region are still largely plagued by famine. Today, a long-time drought is increasing famine levels in the region. 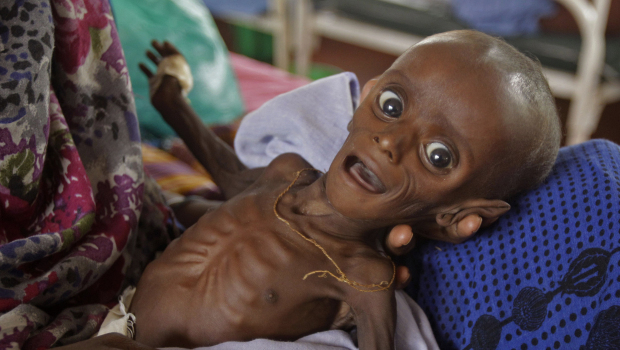 The region suffers from war, starvation, easily preventable and curable diseases. These problems exist across the Third World. Capitalism causes an uneven distribution of wealth worldwide. Like much of the Third World, the Lower Shabelle region is becoming a mass grave. Those who had done nothing but having the mere misfortune of being born in the area are starving to death. The situation is expected to get worse, not better, in the meantime, and is not expected to improve until 2012. Refugees are rushing to Mogadishu and Ethiopia. The people of Djibouti, Ethiopia and Kenya are suffering horrific losses also. To add to all of these problems, eastern Ethiopia and southern Somalia have restricted humanitarian access. The people living in these areas are fighting and struggling every day just to see another tomorrow. Almost 9 million people in the Horn of Africa are without food and safe water. European and American imperialism has ravaged and raped the entire continent. This makes the people more at risk in times of crisis and natural disaster. It is important to mention that the drought in the Horn of Africa is only a part of the horrors of poverty in Africa. The drought is not the root of the problem. The imperialists, over centuries, underdeveloped Africa and stunted its local economies through plunder, slaughter, slavery, exploitation, economic manipulation, and the creation of dependency on “aid”. (6) They destabilized Africa, crushing and squeezing her for all she was worth. Africans have food. Lots of food. (7) They grow much of what First Worlders wear and eat. Africans starve. First World peoples and their allies benefit. The capitalist profit motive prevents resources from being put towards human need. Today, African economies are unstable. The African peoples have been rendered unable to protect themselves against natural disaster. When it hits, they are reliant on “charities” and “humanitarian works” from the imperialist countries, which only serve to further Africa’s dependency. Despite the deplorable and indisputable conditions imperialism has created and the drought has multiplied, there are various Third World groups (such as the Somalian rebels and the Ethiopian government) who say that they have been exaggerated by the UN and other imperialist forces in other to justify imperialist intervention and meddling. (8)(9) However, the crisis is real, as is the imperialist attempt to use it as a justification for further intervention. Imperialists create the problem, then use it as an excuse to intervene. Capitalism is crisis ridden by nature. Capitalism is irrational from the standpoint of human need. Capitalism puts profits before people and the natural world. Marx called this the anarchy of capitalist production. By contrast, communism is not governed by cold market forces. Communism is governed by “from each according to his ability, to each according to his need.” Communism coordinates human and environmental needs with production and resources using science. Leading Light Communism, the revolutionary science of our era, is the only way to end famines like these once and for all. The next great wave of revolution will carry our banner because of this. It will carry our banner because our ideology is grounded in reality, in today’s world. Capitalism is not scientific. Capitalism is driven by profit, not by the needs of human beings. The common peoples of the world are at the mercy of these irrational and anarchic market forces. Therefore, capitalism means that famine can arise from a figurative sneeze upon many Third World economies – which have been rendered unstable by capitalism and imperialism. Those with concern for human life and the well-being of others cannot allow this to continue. Throw your fear behind you. Lenin said that we have to be as radical as reality itself. Wake up and recognize the reality of the world around you. Support the Leading Lights. Follow the Leading Lights. Be a Leading Light. Revolution is the only solution. I enjoy your blog, and the other LLCO sites online. Could you flesh-out the statement: “Only Leading Light Communism can end this famine. ” ? Comrade PF is entirely correct. I have edited the article accordingly, as has Comrade Cherokeetears, who always assists in making my writings the best they can be. Thanks everyone!